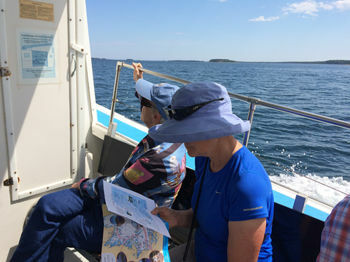 On Saturday, July 30/16, at 2:00 pm, a boatload of enthusiastic people boarded "Risky Business" at Mahone Bay Wharf for a tour of the MICA islands, organized by Margaret MacDonald Trites, of the Records and Documentation Committee. Only a couple of the passengers had ever seen these islands which have been obtained by MICA for public use. 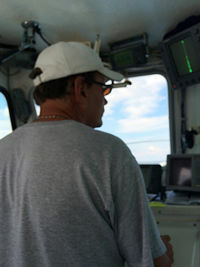 The weather was perfect, and Captain Chris Banfield was very knowledgeable about the islands as the boat approached each one. The passengers were given maps and brochures, so were able to follow along as the tour moved from one island to another. 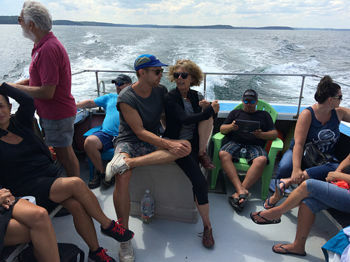 Passengers were also delighted to see porpoises, herons, and seals along the way. Some tasty refreshments completed the afternoon, and a good time was had by all, as evidenced by comments, requests, and emails. A wonderful day for MICA, perhaps to be followed up by another Tour, judging by requests!